This release adds a new usability feature to Adapt It that will be of interest to all users of Adapt It. * Changed Join Documents. Since 2014, it could show the list within the Join Dialog being partially empty, or totally empty. Now, if every adapted document contains a book ID (e.g. MAT, or MRK, or LUK etc) then the list will contain just the chapters of the currently open book ID for the chapter 1 document; otherwise, all documents available will be displayed in the list – which gives the user more work to do to get just the ones he or she wants. Compiling the list takes longer, so please wait. * Modified the Clipboard Adapt feature to stay open until the user chooses to close it by clicking the Close button. This allows multiple small adaptations to be done, without having to open the feature by a menu choice each time some new source text for adapting has been copied to the clipboard. * Protection added which should prevent Auto-Save from causing loss of the user’s adapting work in a file in rare circumstances. (It was caused by a legitimate document destruction being in progress and the auto-save timer fired to cause a document save – but by then the document no longer existed.) Now, doc save and doc destroy are forced to be sequential. If the save begins first doc destruction is blocked until the save completes; if the auto-save begins first, doc destruction is blocked until it completes – and then the auto-save gets its chance, and the app checks for the doc still being in existence – and if it is not, the auto-save is skipped. This means the error will never happen again, and it is now safe to have auto-saving turned on in all circumstances. * Disallowing “Edit Source Text” feature when the Clipboard Adapt feature is in use. * Some extra collection of information for the User Log, to help the developers to find out what might be causing a failure. * When the source text has no upper case/lower case distinction, but the target text does have that (e.g. Arabic script to Cyrillic script), the Auto-capitalize feature did not work. In recent versions we provided a project configuration file line called: SentenceFinalPunctuationTriggeringCapitalization where the user could manually type sentence final punctuation characters which should trigger automatic capitalization of the first word of the next sentence – such as ”’.>!? That was introduced in version 6.8.0. We did not, however, provide a way for the user to add the needed punctuation via the Adapt It user interface. This meant the help we provided became forgotten over time. 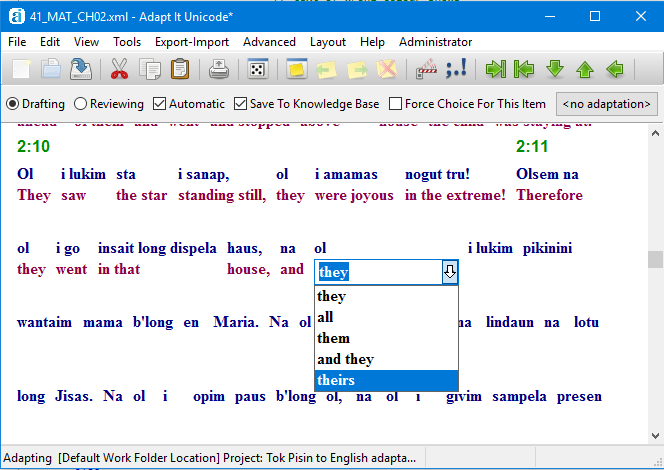 Now a text box has been added in Preferences to allow typing the punctuation there. * Fixed an export bug in which the export would be truncated, or partly lost, if the \x* of a cross-reference which is to be filtered, was absent. * Fixed a bug in collaboration which would declare that the last chapter of a book has no content, when in fact it has. * Fixed a collaboration bug when the user makes single-word retranslations; the target text of these was being wrongly removed from the data being merged in from Paratext’s source text within the collaboration. * Fixed a logic error in the handlers for making a retranslation, or editing a retranslation, which failed to indicate where the retranslation ended. * Fixed a bug in the handler for editing a retranslation which caused a a program crash when editing a retranslation involving one source text word, and there was only one later word in the document (that is, the document source text only had two words, and the first was a retranslation). * Fixed a bug which can appear when Paratext 8 projects have a complex Language identifier field that is made up of more than one code separated by colon characters. Adapt It was parsing the codes wrongly which caused Adapt It to not be able to recognize the Paratext projects after they were set up for collaboration within Adapt It. * Fixed a bug that appeared in version 6.8.3 that would could cause a crash when accessing the Administrator menu after changing to a French or other non-English interface. The Ubuntu Artful distribution only has short term support from Canonical. The Trusty, Xenial, and Bionic distributions are long term service (LTS) distributions which Canonical will support with bug and security fixes for 5 years from their initial release. Important Note: Installing version 6.9.0 will automatically replace any previously installed Adapt It WX (Unicode) version from 4.0.0 through 6.8.3 (but existing project data is never touched when installing updates).